Third time’s a charm! After being in the top three scoring teams in the last year, Calumet High School was able to place first in the 29th annual Bioathlon. The team was comprised of Ada McDonal, Molly Helminen, Nick Djerf and Sam Oja. Second place went to A.D. Johnston High School from Bessemer, and West Iron County High School took third. First, second and third place teams were awarded a plaque to display at school and each student on the team was awarded $200 for first place, $100 for second place and $50 for third place. All bioathlon competitors received a certificate of participation and a t-shirt sporting this year’s competition logo. Microbiology: Designed by Biological Sciences graduate student Tim Buttler, assisted by undergraduate student Paige Webb. Field Identification: Designed by Biological Sciences graduate student Taylor Zallek assisted by graduate student Bailey Duxburry and undergraduate student Hannah Mckinnon Reish. Medical Laboratory Science: Designed by undergraduate Kaycee Kolar and assisted by Medical LaboratoryScience undergraduate students, Eleia Kozminski, Kayla Bates, and Jarett McClanahan. Funding was provided by MTU Admissions, the Department of Biological Sciences, the Michigan Tech Fund, MTU Alumni Mark Cowan, MD, Robert C. and Kathryn DellAngelo, MD, Olive Kimball, D.Ed., PhD, Nancy Auer, PhD, and Janice Glime, PhD. 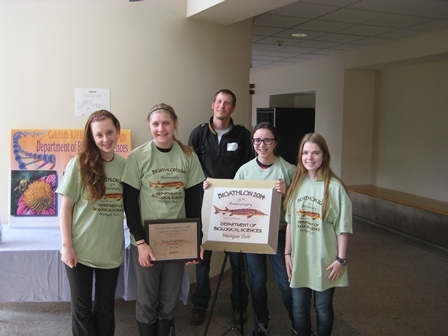 The 28th annual Department of Biological Sciences Bioathlon for high school biology students was held on Wednesday at Michigan Tech. Simultaneously, a workshop was held for the accompanying biology teachers. The Bioathlon serves as a means to stimulate interest and problem-solving in biology among our area youth. Teams from 12 Upper Peninsula high schools participated. The team winning was A.D. Johnston High School in Bessemer. 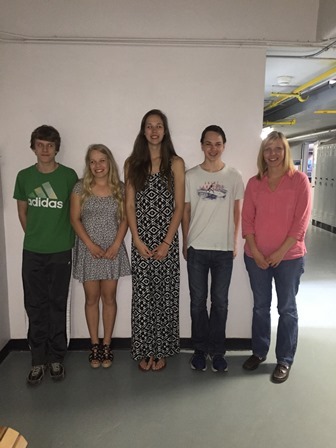 Team members were Devon Byers, Andy Aspinwall, Abbey Johnson and Sydney Wittla-Sprague. The Instructor is David Rowe. Second place went to Marquette, third place was Calumet. Dissection: Designed by Biological Sciences graduate student Ian Greenlund and assisted by undergraduate Beth Chaney. The activity was the dissection of a preserved vertebrate animal with the identification of organs or structures required. Microbiology: Designed by Biological Sciences graduate student Lukai Zhai, assisted by graduate student Rupsa Basu. This activity required students to identify the genus and species of each unknown microorganism by performing three basic microbiology techniques for each unknown. Field Identification: Designed by Biological Sciences graduate student Taylor Zallek assisted by graduate students Sunflower Wilson and Bradley Wells. This activity involved a search for some common organisms or their parts during a brief field trip. Medical Laboratory Science: designed by undergraduate Taylor Tienhaara and assisted by medical laboratory science undergraduate students, Samantha Doyle, Kat Wheeler and Audri Mills. This activity had students competing in hematology, blood banking and donation, urinalysis and laboratory safety. Through these exercises, students needed to demonstrate organizational skills, follow instructions, show a knowledge of facts and concepts, and exhibit laboratory skills and creativity. 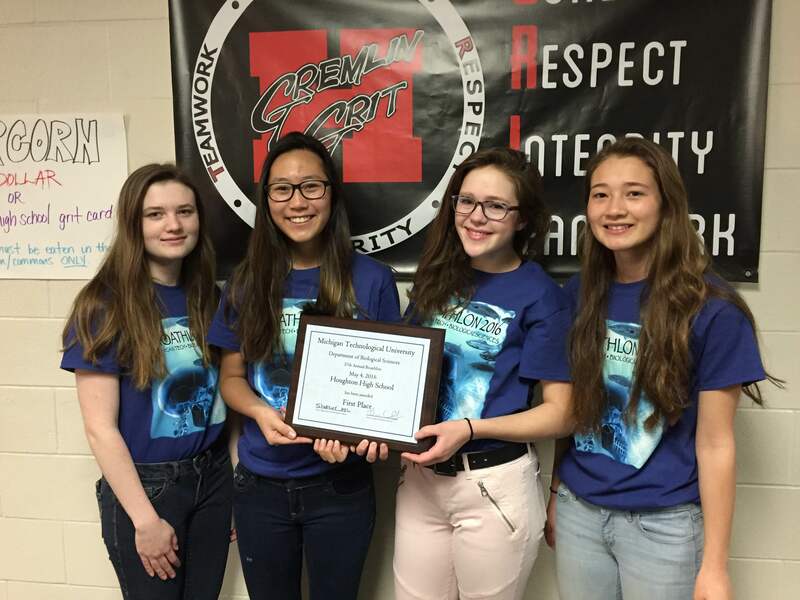 Each member of the first-place team received $200 and a partial scholarship for either forensic science or genetic modification and biotechnology explorations through Michigan Tech’s Summer Youth Programs. Members of the second-place team received $100 and members of the third-place team received $50. Members of the top three teams also received plaques. All students participating in the competition received a certificate of participation and a Bioathlon T-shirt. Marc Madigan, academic advisor in biological sciences, organized an activity for the teachers. He shared forensic science activities that teachers can incorporate into their classrooms. To learn more about Bioathlon click here. dissecting and identifying a list of muscles and other organs found in a pigeon, designed by graduate student Travis Wakeham. identifying different fly genetic traits and explaining how to prepare and read an electrophoresis gel, designed by graduate student Raja Bollepugu. visiting the ski trails to find and identify organisms involved in a food web and explaining how they interact with each other, designed by graduate student Tony Matthys. using medical laboratory science (MLS) techniques to identify a pathogen described in a written scenario, designed by a team of MLS undergraduates Sam Doyle, Shae Thomson, Josh Bowman and Laura Kirwin. While students were busy with challenges their teachers participated in a workshop “Ethnobotany: how people use plants” led by academic advisor and botany instructor, Stacy Cotey. Feedback indicated that the teachers were excited to learn new activities to incorporate into lesson plans. The Department is pleased to use this outreach activity to demonstrate the exciting disciplines available at Michigan Technological University and to support the university’s mission to emphasis Health, Science, Technology, Engineering, and Math (H-STEM) education. We look forward to next year’s competition scheduled for early May 2017. More details about the competition can be found on the Bioathlon web page. The team winning FIRST PLACE was Houghton High School from Houghton, MI. The team winning SECOND PLACE was Calumet High School from Calumet, MI. The team winning the THIRD PLACE was L.L.Wright High School from Ironwood, MI. 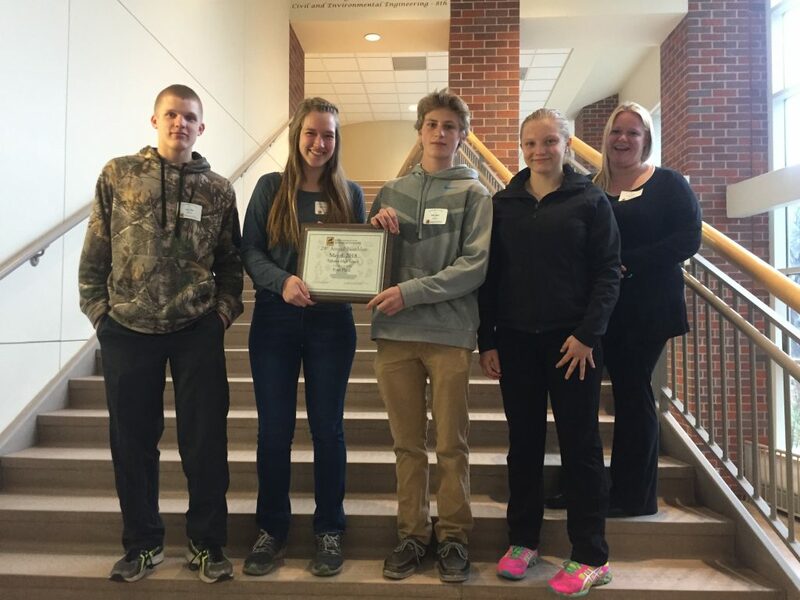 A team of high school students from Calumet High School took top honors in Michigan Tech’s annual Bioathlon, a biology competition held Wednesday. A team from West Iron County High School placed second and a team from A.D. Johnston HIgh School in Bessemer was third. The Bioathlon’s goal is to stimulate interest in biology and in problem-solving among high school students. Teams from 15 Upper Peninsula high schools participated. 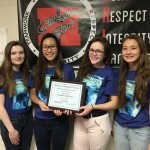 Each team consisted of four students who have not taken biology classes beyond the traditional sophomore general biology course. The teams tackled the same four problems: dissection of a dogfish shark; biochemical effects on enzymes; field identification; and a medical laboratory science challenge. A workshop on animal migration was offered for the teachers who accompanied the students to the competition. Undergraduate and graduate students and biology faculty participated in designing the problems and supervising the competition. Funding for the Bioathlon was provided by Michigan Tech Admissions, the Department of Biological Sciences, the Michigan Tech Fund and alumni Mark Cowan, Robert and Kathryn DellAngelo, Olive Kimball, Nancy Auer and Janice Glime. More information on Bioathlon is available here. The twenty-fifth annual Department of Biological Sciences Bioathlon for high school biology students was held on Wednesday, May 7, at Michigan Technological University. Simultaneously, a workshop was held for the accompanying biology teachers. The Bioathlon serves as a means to stimulate interest and problem-solving in biology among our area youth. Teams from 16 Upper Peninsula Michigan high schools participated. The three top scores go to these schools. The team winning FIRST PLACE was Hancock High School from Hancock, MI. The team winning SECOND PLACE was L.L.Wright High School from Ironwood, MI. The team winning the THIRD PLACE was West Iron County High School from Iron River, MI. Dissection: designed by Biological Sciences Graduate student Robert Larson and assisted by Travis Wakeham and Jenna Edwards with input from Dr. John Durocher. Molecular Biology: designed by Biological Sciences graduate student Emily Geiger, assisted by Jennifer Connors. Field Identification: designed by Biological Sciences graduate student Ashley Coble assisted by Tony Matthys and Troy Long. Medical Laboratory Science: designed and proctored by Medical Laboratory Science undergraduate students, Alyssa Elegeert, Rebecca Kurt, Roger Ellis, Sarah Westdorp, Danielle Dawson and Misty Brouilette with input from Professor of Practice Karyn Fay[j1] . Through these exercises, students needed to demonstrate organizational skills, knowledge of facts and concepts, laboratory skills and creativity. Each member of the first, second and third team will receive a small cash award along with a plaque. Each student participating in the competition will also receive a certificate of participation and a Bioathlon T-shirt. In this workshop teachers explored some of the different roles of the fungi and conducted several simple, inexpensive activities to help students overcome their mycophobia. The workshop was designed and taught by Stacy Cotey, Academic Advisor of Biological Sciences. Lynette Potvin, Ecologist for the US Forest Service Northern Research Station also provided a view of below-ground fungal processes with a tour of the Rhizotron and Mesocosm facilities. Molecular Biology: Designed by Biological Sciences graduate student Emily Geiger, assisted by Aparupa Sengupta. Field Identification: Designed by Biological Sciences graduate student Ashley Coble assisted by Ramana Pidatala and Jamie Olson. Medical Laboratory Science: Designed and proctored by Medical Laboratory Science undergraduate students, Claire Meneguzzo, Christjana Nichols, Brooke Bedore, Kelly Hanes and Misty Brouilette with input from Senior Lecturer Alice Soldan and Professor of Practice Karyn Fay. What’s up with the Weather? Climate Change and Aquatic Life in the Great Lakes. This was an interactive workshop developed and taught by Stacy Cotey, Academic Advisor of Biological Sciences. In the morning, they toured the newly opened Great Lakes Research Center. The center is an interdisciplinary facility that studies the processes, function, and issues of the Great Lakes. They discussed how climate change may alter this dynamic ecosystem. In the afternoon, they conducted activities suitable for the classroom that explored the effects of a changing climate on aquatic organisms in the Great Lakes. They collected and analyzed water samples from the dock at the Great Lakes Center and at Prince’s Point. Funding was provided by MTU Admissions, the Department of Biological Sciences, the Michigan Tech Fund, MTU Alumni Mark Cowan, M.D., Robert C. and Kathryn DellAngelo, M.D., Olive Kimball, D.Ed., Ph.D., Nancy Auer, Ph.D. and Janice Glime, Ph.D. The twenty-third annual Department of Biological Sciences Bioathlon for high school biology students was held on Wednesday, May 2, at Michigan Technological University. Simultaneously, a workshop was held for the accompanying biology teachers. 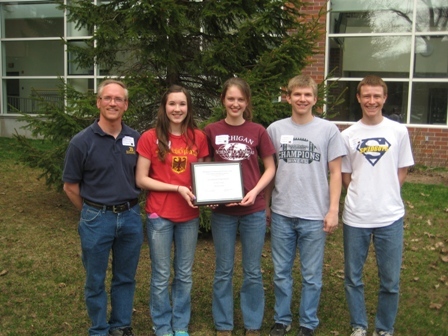 The twenty-second annual Department of Biological Sciences Bioathlon for high school biology students was held on Wednesday, May 4, 2011 at Michigan Technological University. Simultaneously, a workshop was held for the accompanying biology teachers. The Bioathlon serves as a means to stimulate interest and problem-solving in biology among our youth. Sixty four students from 18 high schools participated. 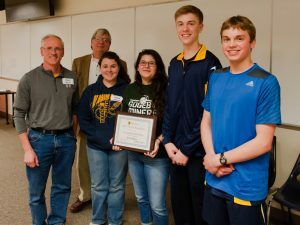 The twenty-first annual Department of Biological Sciences Bioathlon for high school biology students was held on Wednesday, May 5, at Michigan Technological University. Simultaneously, a workshop was held for the accompanying biology teachers. The Bioathlon serves as a means to stimulate interest and problem-solving in biology among our area youth. Teams from 16 Upper Peninsula Michigan high schools participated. The 20th Annual Department of Biological Sciences Bioathlon for high school students will be held Wednesday, May 5, on campus. The Bioathlon is the department’s outreach program, which serves to stimulate interest and problem solving in biology among area youth. Sixty students from 15 Upper Peninsula high schools will participate in activities designed by Michigan Tech faculty members and graduate students of the department.